Medical products (devices, drugs, or biologics) contain information in their labeling regarding the manner in which the manufacturer has determined that the products can be used in a safe and effective manner. The U.S. Food and Drug Administration (FDA) approves medical prod- ucts for use for these specific indications that are part of the medical products labeling. When medical products are used in a manner not specified in the labeling, it is commonly referred to as off-label use. The practice of medicine allows for this off-label use to treat individual patients, but the ethical and legal implications for such unapproved use can be confusing. Although the responsibility and ultimately the liability for off-label use often rest with the prescribing physician, the medical physicist and others may also be responsible for the safe and proper use of the medical products. When these products are used for purposes other than which they were approved, it is important for medical physicists to understand their responsibilities. 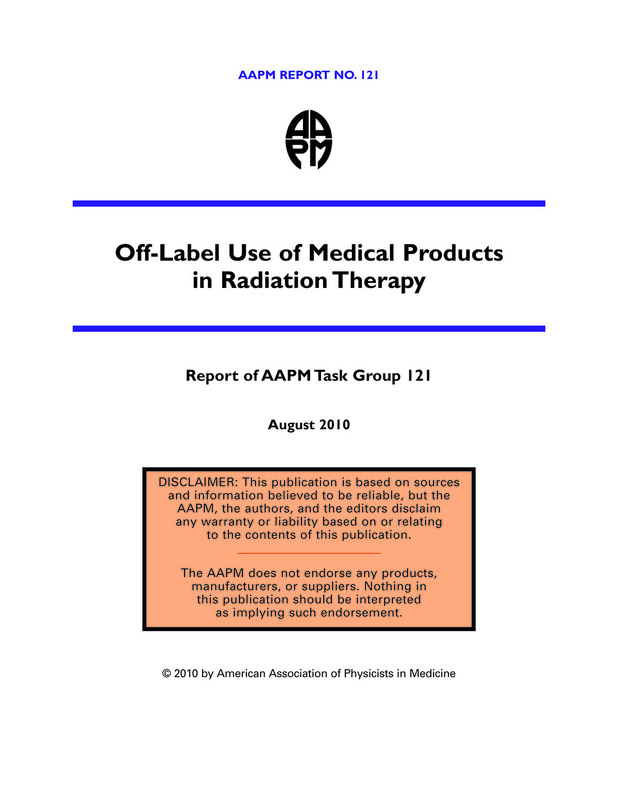 This report summarizes the various ways medical products, primarily medical devices, can legally be brought to market in the United States and includes a discussion of the approval process, along with manufacturers’ responsibilities, labeling, marketing and promotion, and off- label use. This is an educational and descriptive report, and does not contain prescriptive recommendations. This report also addresses the role of the medical physicist in clinical situations involving off-label use. Case studies in radiation therapy are presented. Any mention of com- mercial products is for identification only; it does not imply recommendations or endorsements by any of the authors or the AAPM.